As amateur programmers create their own modifications, Quake II is changing — for the better. As amateur programmers create their own modifications, everybody’s eager to be crowned King, so all the players converge on one chaotic spot. You’ll need a cunning offense and an adrenaline-soaked defense to stay on top. The original Quake spawned tons of homemade levels, monsters, vehicles, movies, and conversions— everything from a racing game to Quake chess. 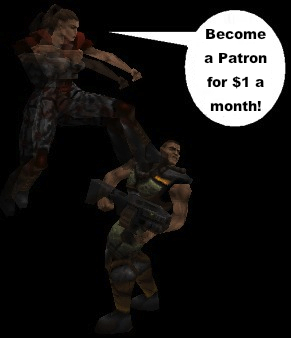 When Quake II came out, the creative floodgates reopened, letting in flag captures, robotic opponents, and prison revolts— all of which can be downloaded and played online for free (with a retail copy of Quake II, of course). Here’s a sampling of the best homebrewed mods for Quake II (so far). When you get tired of plain ol’ deathmatches, it’s time to Capture the Flag. Two teams face off in an attempt to grab the other team’s flag and bring it back to their own base. A new weapon, the grappling hook, allows for more mobility and quick getaways, while four Tech power-ups (“runes” to (TTF old-timers) enhance your shields, health, speed, or power. Try id’s official version of CTF (a.k.a. Zoid’s CTF) or one of more than a dozen variations, including the extremely complex Battle of the Sexes, which adds character classes a la Team Fortress; or the very impressive Loki’s Minions variant, which includes original levels, cool new skin sets, and the capability to fire the grappling hook and another weapon simultaneously. In Jaiibreak, players also raid the enemy’s base, but this time you’re not capturing a flag— you’re liberating captured teammates! Every time a soldier is fragged, they’re respawned inside the enemy jail (which plays cheesy elevator music Just to make it that much more humiliating). If they all get caught, the incarcerated players are executed— but if Just one teammate storms the Jail and frees the hostages, it’s an ail-out prison riot! If the enemy team steals your flag, do whatever It takes to get It back! Some jails have sneaky escape routes; others have only a main gate that must be opened by someone on the outside. A variation on the playground classic Kill the Man With the Ball, the gameplay of Holy Wars centers on a glowing Halo. Whoever picks it up becomes the Saint, gaining some health and armor as well as an easy-to-spot yellow disc that floats over their head. Only the Saint gets points for frags, while everyone else tries to waste the Saint and steal the Halo. Frantic? Yes. Silly? Oh, yes. Fun? Absolutely. Every version of Capture the Flag features a new weapon, the grappling hook, in one form or another. Step one: Find the Hill. Step two: Claim it. Step three: Defend it! Sounds simple, right? Well, the “hill” may not be what you think— it could be inside a building or on the deck of a floating pirate ship. Plus, In King of the Hill, getting there is half of fun. Staying there is the rest. Do you have what it takes to be a Saint? Do you have what it takes to remain a Saint?